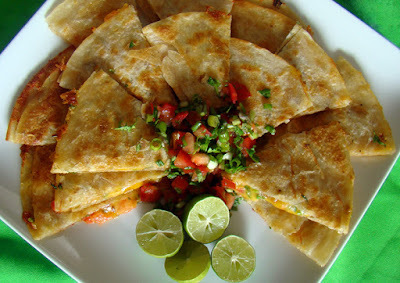 Phoenix Family Foodie Blog: MAKE YOURSELF A DANG KESA-DILLA ! MAKE YOURSELF A DANG KESA-DILLA ! This week is going to be a blogging blast! If you know me at all, you know that my entire family and I speak "movie," meaning that our every day vocabulary consists of thousands of movie lines that we've grown to love over the years. In fact, an obscure movie quote from my husband that only I could understand is what made me fall madly in love with him! So, this week, I'm combining some of my favorite movie quotes with some of my favorite dishes and we're going to have Movie Mania Menu Week! Doesn't that sound fun?! I'd love to have some contributions from all of you, so if you think of a dish or a foodie movie quote that made a movie famous, PLEASE e-mail it to me and we'll get it into the test kitchen! Kicking off this week is one of my all time favorites, Napoleon Dynamite. Not only is this film laden with great one-liners, it's a perfect example of how great friends can be when they come together for you. I know if it weren't for all my foodie friends, you wouldn't be reading this blog right now, so this first dish is for all of you. This, my friends, is the DANG KESA-DILLA! 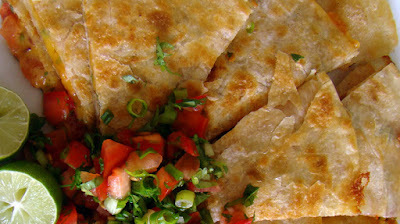 It's more than just cheese and tortilla, it's got bacon, tomato, scallion and cilantro. Dip it in a little hot Sriracha for a big rooster boost, and you've got an instant party appetizer. Enjoy! In a large skillet, cook the chopped bacon until its brown and crispy, about 7-10 minutes. Drain from the drippings with a slotted spoon and set aside. Reserve about 1 tbsp. of the drippings and keep the skillet hot. In a medium bowl, chop and combine the tomato, scallions and cilantro. Set aside. Spray the heated skillet with cooking spray. Place one tortilla flat in the bottom of the heated skillet and sprinkle 1/4 cup shredded cheddar cheese on top of the tortilla. Spread about 1/2 of the chopped bacon on top of the cheese, and about 1/3 of the tomato mixture on top of the bacon, and another 1/4 cup of the cheese on top of the tomato mixture. Place a second tortilla on top. Press lightly with a spatula to melt all the ingredients together and continue to cook for about 2-3 minutes per side. Spray the top tortilla with cooking spray before flipping over and cooking the other side. Remove from the heat, allow to cool for 2-3 minutes and then cut into sections with a pizza cutter. Repeat steps for the second KESA-DILLA. Garnish with remaining tomato mixture and limes. Serve immediately.